On our way to Kindergarten is the work of this room. Through Child-centered play and Teacher- directed activities each child encounters a wide variety of experiences to lead them to the next level in their learning. At the center of each day is the Bible story of the week. From there science, art, motor, and play experiences develop. I have taught in every grade level preK-High school since before the turn of the century!! I have been teaching and directing at Redeemer since it opened in 2003. Early childhood is the best of all worlds in teaching. I am married to a Sunburg farmer, Russ. We have 3 girls- two in college and one in high school. I have many hobbies that keep me busy when I am not chasing my children like gardening and scrapbooking. 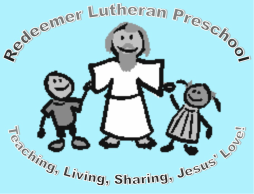 I have been an educator in the LCMS Lutheran Schools for most of my career. I spent some years at KMS and Benson after we moved to MN from NE. At Redeemer I play organ and substitute for the Handbell Choir. I also strive to work toward integrating our ministries with the preschool. As we begin the last few weeks of school our lessons focus on the job Jesus' gave his disciples (and us)- to go and make disciples of all nations. What do you tell others about Jesus? That is a question I am asking the children. Can they tell what they have learned this year from preschool, home and Sunday school? Will they continue to tell this great news throughout a lifetime? I pray that they do. Our themes also focus on the outdoors- weather, water, ships, gardens. I am leaving some homework here for you and your child to do together. Bring back the answers for a prize!! 3. Something blowing in the wind. 10. Something that has changed shape because of the weather. A song I taught the class this spring was "Cumbayah" Cumbayah means "Come by here," so we discussed that the prodigal son may have prayed something like Cumbayah- asking God to come by here (or him) and bring peace. A few have asked since then "how did that song go?" so I am sending the words to you. It is likely you can find the tune on Youtube if needed.